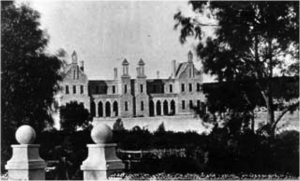 Western Australia welcomed the transportation of convicts in 1850 as a solution to the economic problems which had affected the colony since its foundation as a free settlement in 1829. However, the 1857 Penal Servitude Act significantly altered the kinds of convicts being sent as deportation was discontinued for sentences shorter than fourteen years. As a result, it quickly became apparent to the colonists that a significant number of the men who were transported after this period were no longer as beneficial to the colony. (1) A particular concern of the colonists was the mental health of the arriving convicts, resulting in demands to build a secure institution on the outskirts of the colony. Yet, despite the detailed records created by both the convict system and the Colonial Office questions regarding the colonists sudden desire to establish a lunatic asylum remain. Whilst the number of convicts recorded as insane remained relatively low during the colony’s first decade as a penal colony, the ‘authorities’ inability ‘to dispose of them’ was a concern for the colonists from the beginning. (2) By October 1857, twenty cases of lunacy were recorded by the convict establishment. Although the colonists requested their removal to a specialist facility ‘in some cheerful part of the country’, the colony’s financial situation dictated a ‘cramped’ warehouse in Fremantle was to be used. (3) This newly formed asylum was under the control of the Comptroller General of the Convict Establishment, and accommodated the convict patients with both physical and mental illnesses. Another subject which Attfield alluded to in his reports was the treatment of convicts who were deemed ‘morally insane’, a problem which medical officers in Britain also faced. (7) The difficulty arose in trying to establish if the patients were actually insane, or merely, as one judge noted, displaying signs of ‘insane morality’, which referred to a propensity to commit crime, coupled with a determination to resist being subjected to any laws, which they knew were ‘wrong’. (8) Though now outdated, the concept of ‘moral insanity’ did allude to a (practical, if not necessarily psychological) problem of many of the men who became trapped in a cycle of re-offending. A situation which was made worse by the declining need for convict labour within the colony following the increase of free migrants after 1850. Those in the asylum who had genuine mental health issues, often resulting from trauma within the convict system had to deal with the stigma of having been both an inmate of the Fremantle Convict Establishment and the Lunatic Asylum. Despite the surgeon’s best efforts to replace confinement with rehabilitation the lack of space and knowledge on mental health meant seclusion and restraint would remain an unavoidable aspect of the patient’s treatment. By rejecting the convict population, because they were no longer useful, the colonists had inadvertently transformed the asylum into an overcrowded shelter for the socially unacceptable. Not only did this have a negative impact on the men and women who required specialist attention, it also led to a negative cycle of confinement for the convicts who had no other support. Rather than accepting pardoned convicts as valuable members of society, the colonists had instead chosen to denigrate the men they themselves had openly requested. Unwittingly creating a much larger burden in the process, as the convicts they wished to ignore became fully dependent on a system most would never escape.